Also, the dashboard doesn't support being passed the login token (I'll open another pull request for that). Delete the CLI interface for installing. The web UI obsoletes it. Any way to avoid duplicating the cert images and code? I don't like my current solution for sharing the cert install view as it requires updating the Gemfile.lock to propagate changes (i.e. always two commits and delayed feedback as to any dashboard breakage). I think copying the files via the Tupfile is best. Symlinks don't work on their own as the files they point to become unavailable. This should also run open or the OS equivalent on the URL. Look around for a list of the equivalent on Linux. When I open the same URL in another tab while deploying it appears to be pretty broken. 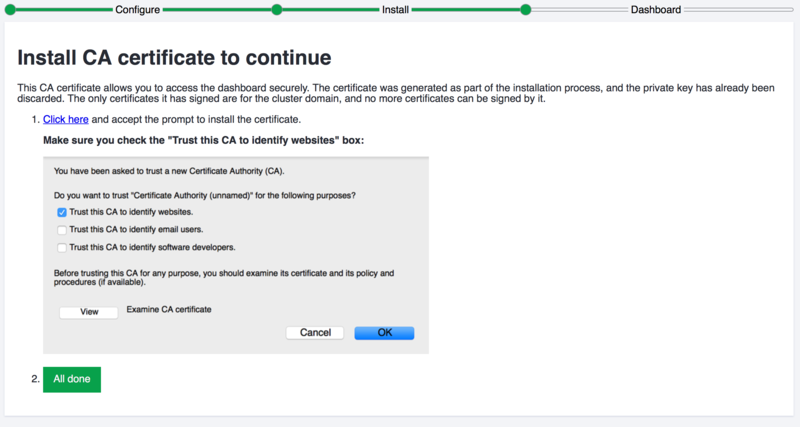 Loading the install URL after a successful install prompts me to install the CA certificate again. It should send me to the dashboard. The HTTP server should bind to 127.0.0.1:0 so that the port is unpredictable and available. The dashboard will need to setup CORS for localhost in order to properly test the certificate before redirect (the other option is setting flag in localStorage indicating the cert has been installed, but I think having a verification step is better). This will also allow the installer login to the dashboard instead of redirecting with the token in the URL. One possibility is for the installer to set an ENV variable with the localhost address on the dashboard app. I prefer using a struct with fields and handler methods over globals. Looks like this needs a mutex lock? Return after the 404 instead of using else. What's left on building the assets and putting them into the binary? Assets are bundled into bindata.go with go generate (requires bundle exec rake compile to be run in the app directory first). @titanous asset compilation via go-bindata is moved into the build process. The install cert view is shared between the installer and dashboard.